NSWCA The Nassau Suffolk Water Commissioners’ Association was recently addressed by guest speaker Austin R. Graff attorney at law, of The Scher Law Firm, LLP, (Carle Place, NY). The meeting was hosted by Cathedral Gardens Water District and NSWCA. Mr. Graff’s in-depth presentation centered on Civil Service Reporting Requirements including hiring practices and steps to ensure that the duties performed by employees are within title. Other key topics included the need for employees of Special Districts to abide by Civil Service Rules and Procedures at all times, Competitive / Non-Competitive / Laborer titles, and probation periods. 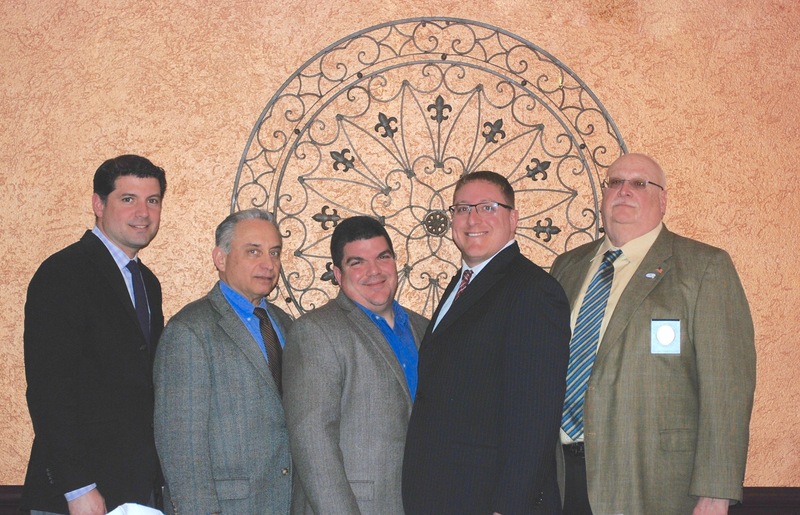 Left to right: NSWCA 1st Vice President Michael F. Rich III of the Oyster Bay Water District; Treasurer Lawrence F. Zaino Jr. of the Carle Place Water District; NSWCA President and Westbury Water Commissioner Vincent Abbatiello; Guest speaker Mr. Austin R. Graff; 2nd Vice President William Schuckmann of the Hicksville Water District.